Ginger, ginger! Oh bliss! Oh glee! We grew a trial batch of ginger this year. Here. In South Dakota. 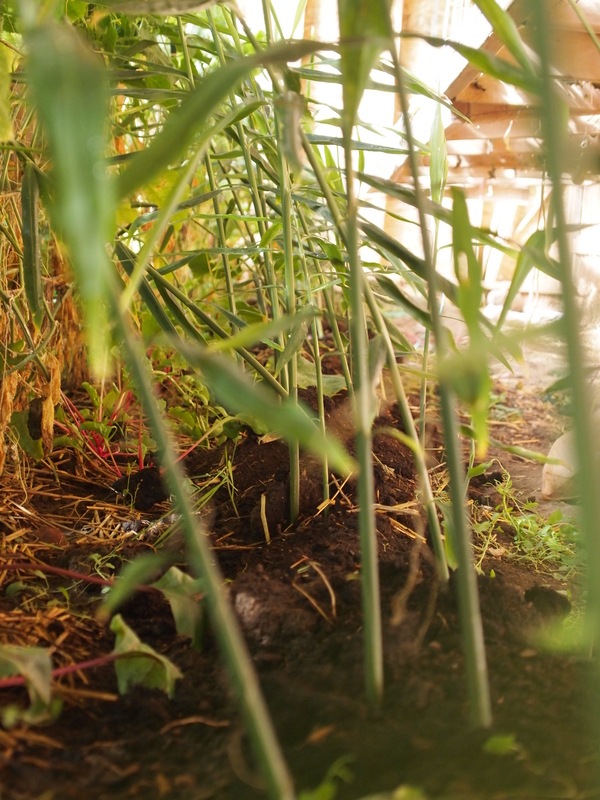 We had been introduced to high latitude ginger farming at the conference at Stone Barns, in the Hudson Valley. 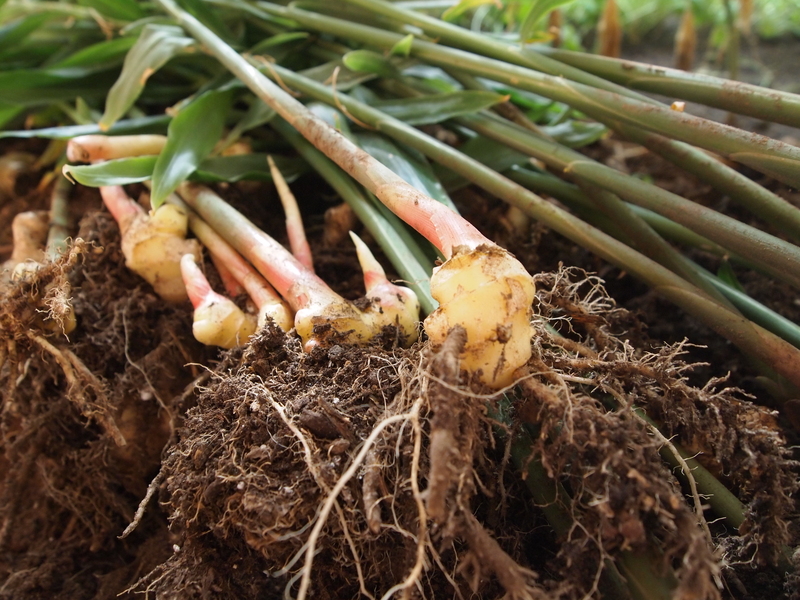 Even without a full, long season of heat, ginger can be grown in a greenhouse and harvested early, as baby ginger. Amazing ginger. It is touted as delicious, versatile, highly valued, easily marketable, and, of course, totally hip. And, as it turns out, the north wall of our greenhouse is a bit like the north shore of Hawaii. Happiness abounds! Baby ginger is also called ‘pink ginger’ or ‘spring ginger’, sometimes ‘ginger’s mild-mannered younger sister‘. Unlike the characteristically gnarly mature ginger, baby ginger has a more mild flavor and is less stringy. Plus it’s thin-skinned and doesn’t need to be peeled. 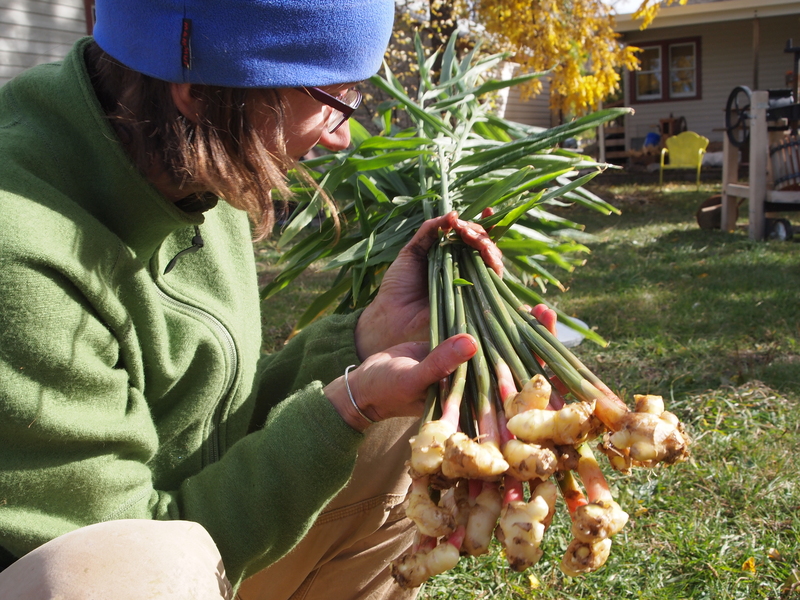 We are thrilled beyond measure to be including ginger in the CSA shares this season. CSA friends: on the off chance you need some ideas, things to think about and google recipes for, consider candied ginger, pickled ginger, tea, Kimchi, ginger juice cocktails, dried ginger. The greens can be added to a dish (soups, stir fry) while cooking for additional flavor, just remove them before serving as they are tough. You can also freeze your ginger, for use later this winter. Here is some baby ginger reading from NPR, with recipes – Tickled Pink: Fresh, Young Ginger Is A Sweet Break From Gnarled Roots. And more smart ginger recipes, ideas from The Guardian, The 10 Best Ginger Recipes. Peel the ginger root (pink ginger probably does’t need peeling) with a peeler or with the handle of a spoon. Grate the ginger with a grater/zester. If you slice it, slice it thin and use more. Infuse the ginger; if you add cinnamon, mint, chamomile or cayenne, add it here. If you are using a saucepan, bring the water to a boil, add ginger and turn off heat. Put the lid on it and let it steep for 10 minutes. If you are using a teapot, add ginger in the teapot and pour boiling water in it. Let it steep for about 10 minutes. If you are using a saucepan, strain the water to remove the ginger. Add fresh lemon juice and natural sweetener if you like. Stir and enjoy! If you want a cold tea, let your tea cool down, store it in the fridge and add ice cubes before serving. This entry was posted in farm update and tagged bliss, ginger by Cycle Farm. Bookmark the permalink.